Draw: 25-50#Measuring draw length: 30"
Measuring draw length: 30"Maximum draw length: 33"
Scythian Bow with arrow rest available in left or right handed. 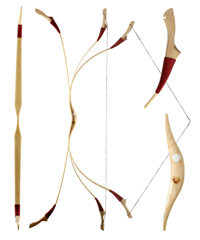 This nifty 48" bow has clear fiberglass over limb lamination's of beautiful olivewood and core lamination's of maple with multicolored mycarta tip overlays. The handle is made of zebra wood with a combination of bubinga and maple accent stripes. This bow can be drawn up to 29". It comes in either 40, 45, 50 or 55# and uses a fast flight Flemish string. Brace height 5 ½ - 6". Especially suitable for the quick shots from a horse, canoe or ground blind. Choose right or left hand and bow. 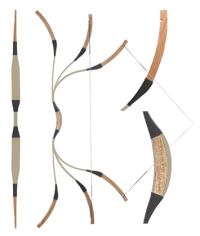 This solid Hickory bow is both affordable and rugged, making it perfect for the beginning archers with a short draw. Available in two lengths: 48" has a draw length of 24" and pulls about 10-15 pounds and 65" has a draw length of 26" and pulls about 20-25 pounds. A natural wood color, it is available in right or left hand. Please specify when ordering. 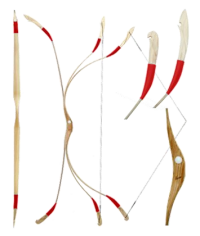 These bows are made of high quality Manau Wood from the Totthan Palm Tree. This wood is extremely flexible and resilient. 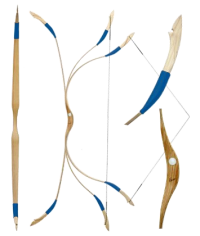 These bows are widely used in medieval reenactment groups and are great for beginners. Authentic looking, smooth drawing and economically priced. 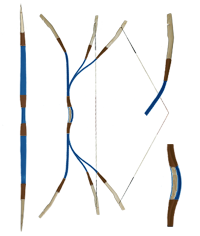 Bows are ambidextrous and can be shot right or left handed. Available in 30", 40", 58", and 68". The 30" bow weighs 8 Lbs. @ 14", 40" bow weighs 20 Lbs. @ 21", 58" bow weighs 29 Lbs. @ 27”, and the 68" bow weighs 40 Lbs. @ 28". 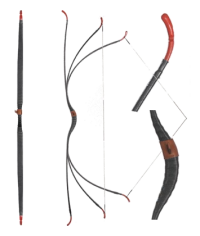 Both the 30" and 40" bows have do not come with a leather grip on the handle. Made from solid hickory and tough as nails this bow can deliver heavy hunting arrows down range with enough power to deliver the blow you need. It may be a simple solid hickory bow, but, you will be surprised at how well it takes the tough conditions of the field. It can also be a simple target bow. It is extremely accurate with a set of well matched arrows. 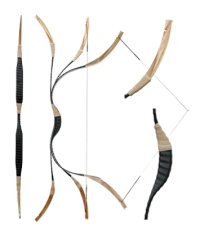 Ambidextrous arrow rests so that it doesn't matter if you are right or left handed or right or left eye dominant this bow will fit just right for you. Finished with a tough polyurethane Available in draw weights from 30-35 to 50-55. Approximately 72" tip to tip to handle even the longest draw lengths. 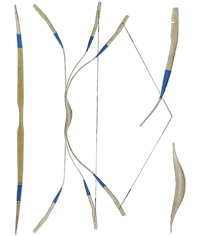 Hunt the way the primitives did with this simple but elegant 70" flatbow. 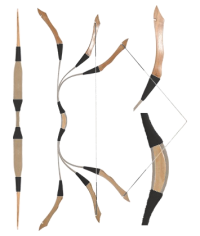 It is a great shooting bow with a smooth draw. 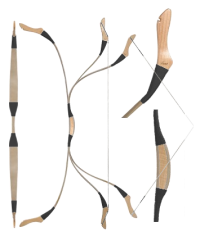 Made from one piece of solid white sapwood Hickory and stained a rich brown color, it comes with a plain un-served Dacron Flemish string and a bow loop style bow stringer. *Now available in Right or Left hand*, it is weather sealed with a 28" draw. Available in draw weights: 30-35, 35-40, 40-45, 45-50 & 50-55. Please specify draw weight and Right or Left Hand when ordering. 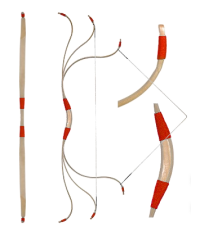 This powerful and accurate English Longbow has a seriously smooth draw that only a bow like this can deliver. 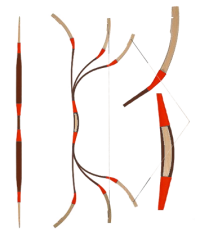 72" tip to tip, it is not only an excellent target bow, but a deadly hunting bow as well. 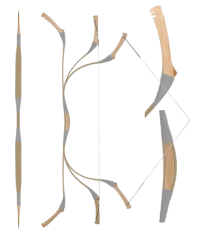 This bows' 8 to 5 thickness ratio and rounded English belly as well as it's 1 1/8"-1 1/4" handle, meets most English Longbow society and shooting club rules. 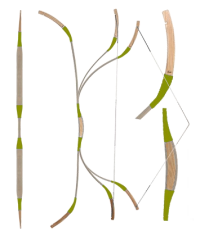 The triple lamination of Bamboo backed Hickory with a core of Bamboo fast flex gives this bow an elegant look along with superior strength and durability. 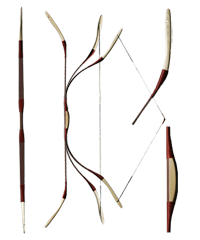 Bow comes with an un-served Flemish Dacron string and a loop style bow stringer, 72" long. 28" draw length. 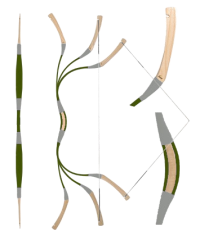 Available weights: 40-45, 45-50, 50-55 & 55-60.
the angle of the siyahs makes the use of the bow nearly inaudible.